Are you into romance stories? Probably not, but prepare to help an unusual guy get his unusual doll! Begin by speaking to Ug in the Troll Stronghold. First off, make your way into the Troll Stronghold. You'll need a pair of Climbing Boots, which can be bought from Freda, located southwest of the stronghold itself. Climb along the rocky path, past the Trolls' fighting arena and through the cave. Run past the Thrower Trolls using your Protect From Missiles Prayer and continue along the path until you enter the stronghold. 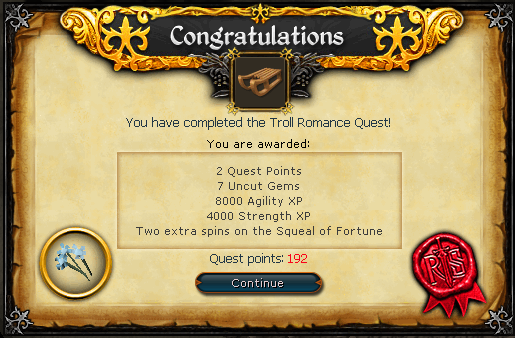 For a more detailed explanation, check out the Troll Stronghold Quest guide. Once inside the Stronghold, head north and go down the stairs. Now follow the corridor south until you find a door on the west side. Inside, you'll find Ug, who seems to be crying. Ask him about what the problem is, and he tells you that he loves Aga, but Arrg, a much stronger Troll is seeing her. Tell Ug that you'll try and help. Now head north into a room where you'll find both Arrg and Aga. Speak to Aga and ask her about her love life. She isn't quite sure if Arrg really loves her, but if he brings her a Trollweiss flower it will prove that he loves her. Now visit Freda in her small house just outside of the village of Burthorpe. Ask her about where you can find the Trollweiss flower, and she'll first say that it's impossible to get it. Eventually though, she'll tell you that you need to find the home of the Ice Trolls, and that you need a sled to get down the mountain to get the flower. 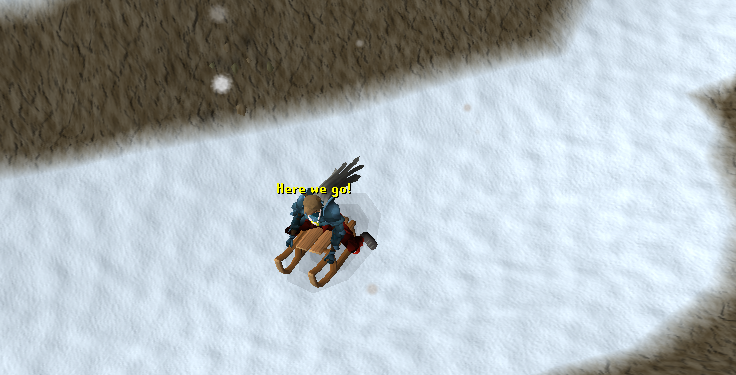 Now find Dunstan in the northeast corner of Burthorpe and ask him about building a sled. He says that you'll need some Yew or Maple Logs, a Rope and an Iron Bar, and after you have everything he will build a Sled for you. You'll now need to wax the Sled so that it holds up while sledding, which requires some Wax, Swamp Tar and a Cake Tin. To wax it, obtain some Insect Repellent from the house north of the Catherby Bank, and then use it on a Beehive to the west of the town. With a bucket in your backpack, choose the "Take From Beehive" option. Now get some Swamp Tar and mix it with the Bucket of Wax to get Wax. With the Cake Tin in your backpack, use the Wax with the Sled. Now head back to the Thrower Trolls on Troll Mountain, before you reach the entrance to the Stronghold. Just beyond them should be a path to the north and it will begin to snow. Follow this path until you reach a gate made of ice. Several steps to the west should be a Rockslide, and then head northwest along the cliff to a cave. 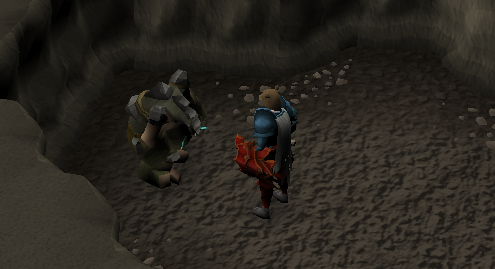 Inside, you'll find various sized Ice Trolls, ranging from level 120-124. Follow the passage and leave through the Crevasse. Now head south and "Slide Down" the Slope. You'll see your character sledding down the mountain, jumping over snow banks, and you'll eventually end up in a clearing. 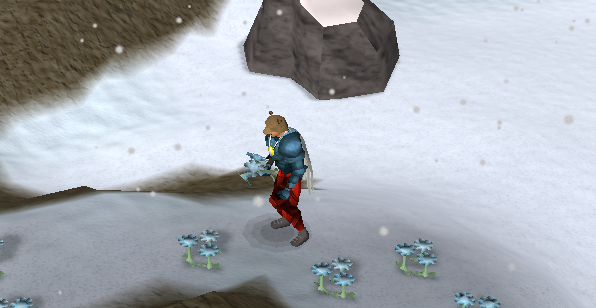 There are several Sled and Chaos Rune respawns along the edges of thearea, and to the southwest is an area to pick the Rare Flower, Trollweiss. Pick one flower for Ug, and then you can either teleport out, or head further south and slide down the slope again. If you go sledding, you'll come to a cave with several Mountain Trolls inside. When you exit, you'll end up just east of Rellekka, the Barbarian Town. Now bring the Trollweiss back to Ug in the Troll Stronghold, who now needs you to defeat Arrg for him. Talk to Arrg (level 77) in the room to the north and tell him that you've come to kill him. He'll bring you to the Troll Fight Arena and immediately attack you. 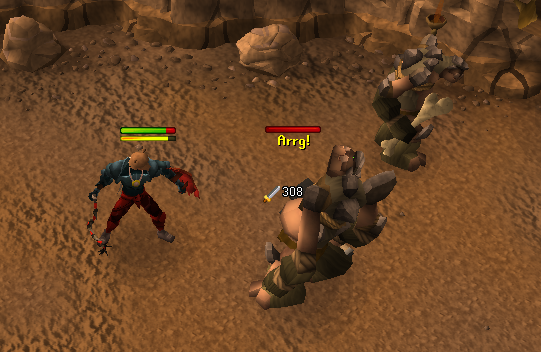 Arrg will attack with both melee and ranged attacks, but his ranged attacks hit less often and they are less strong, so it is advised that you to use your Protect From Melee Prayer. Just keep your hits up and he will eventually be defeated. Now just head back to Ug, give him some advice, and then you'll be finished with the quest.